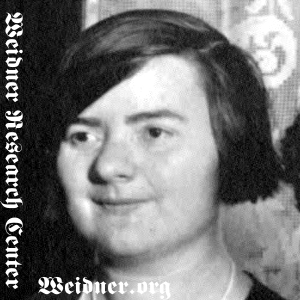 [S11] John J. Weidner, Compiled Birth, Death, 386, states she died 4 Aug 1987. [S758] Daily Herald, 05 Aug 1987, sect. 1, p. 9, col. 2, Death date and location. [S11] John J. Weidner, Compiled Birth, Death, 386 date only. [S758] Daily Herald, 05 Aug 1987, sect. 1, p. 9, col. 2, Burial date and location.